Salford owner Marwan Koukash says Australian forward Cory Paterson has agreed to join Leigh for 2016. He has also confirmed that big-money buys Rangi Chase and Harrison Hansen will be allowed to leave the club as free agents. Koukash has also revealed to Press Association Sport that Australian forward Paterson will go as part of a major shake-up as director of rugby Tim Sheens prepares to rebuild the squad following their brush with relegation. 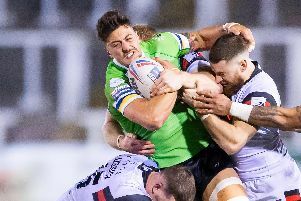 With the club’s Super League future assured following Sunday’s Super 8s win at Widnes, Sheens is expected to announce the first of up to eight new signings in the next 48 hours. Salford had already announced the departures of Adrian Morley, who is retiring, and fellow front rowers Lama Tasi and Scott Taylor, who are joining St Helens and Hull respectively. Koukash said Hansen, Chase and Paterson, will now leave the AJ Bell Stadium, along with scrum-half Theo Fages. According to Koukash, Paterson, who joined the Red Devils on a two-year deal from Wests Tigers 12 months ago, has agreed a move to Championship club Leigh. “Cory is under contract with us for next year but he wants to go to Leigh and we’re not going to stand in his way,” Koukash said. Chase, the 2011 Man of Steel who played for England in the 2008 World Cup, was suspended earlier this month after failing to report for training on time and is now on sick leave. “Back in June he asked for a transfer and we granted him that,” he said. “As a thank-you for his service to the club, we have told him we will not ask for a transfer fee, even though we paid a very sizeable fee just under two years ago.